The March 20 meeting of the Cuyahoga County Health, Human Services and Aging committee featured a presentation from the Director of Cuyahoga County Job and Family Services about the county’s phone system for determining assistance program eligibility, and testimony about multiple contracts for child support and the Board of Developmental Disabilities. Kevin Gowan, the new JFS director, shared a PowerPoint presentation about the county’s phone system to determine eligibility for the Supplemental Nutrition Assistance Program (SNAP) and the Ohio Works First program. Recently, the county came under scrutiny from community organizations such as the Cleveland Food Bank, and elected officials, about long wait times that callers experienced when they called in to determine their eligibility. This development was on the heels of Southgate Neighborhood Family Services Center closing in 2016. It closed as a part of an effort to reduce physical space costs. At the time, the county encouraged people to call in to determine their eligibility. However, there was significant concern from community members and elected officials for those people who still wanted to speak to an individual in person. In response, the county added a coordinator at the Maple Heights Senior Center to assist those who did not, or could not, call in to the county. Recently, the county came under scrutiny from community organizations such as the Cleveland Food Bank, and elected officials, about long wait times that callers experienced when they called in to determine their eligibility. 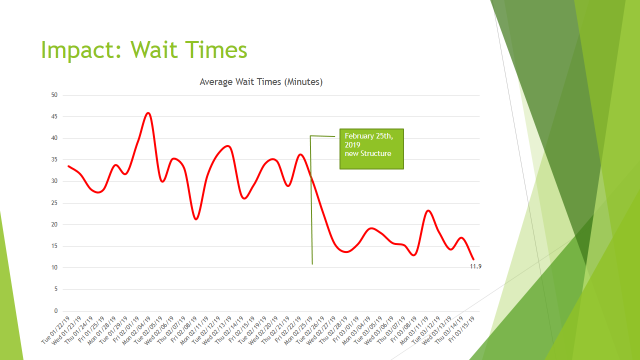 Those who did call in experienced long wait times, with an average wait time in January 2019 of more than 45 minutes. In addition, the county averaged fewer than 50 percent of calls answered in the first place, due to the number of people who hung up early. In response, the county changed the call-sorting process. Now, there are two tiers for callers, one tier is for questions and applications that are straightforward, and another tier deals with more complex cases. As a result of the reorganization, according to the county, the number of answered calls dramatically increased (from 30 percent at its lowest point, to upwards of 70 percent per day). Additionally the hold time has decreased to an average length of time between 10 to 15 minutes. The county receives between 4,000 and 5,000 calls per day, with the highest number of calls towards the beginning of the month, according to Gowan. The committee had several questions. Vice President Pernell Jones noted that the charts provided to the committee, showed 2,500 calls were answered, yet another graph showed 50 percent of calls were actually answered. Jones wanted to confirm that this meant that a total of 5,000 calls came in. Gowan said that is correct. Gowan added that he wants to see a smaller number of unanswered phone calls. He later added that the county has 40 open positions for call center employees, and 12 employees are undergoing call center training. Councilwoman Shontel Brown said she wanted to ensure each client who calls in receives high quality service. She asked Gowan if there is an ability for the county to provide an estimated wait time to people who call in, like other customer services organizations offer. Gowan said that the call system they use is managed by the state and that the county supports adding that feature, but the state has not yet allowed that to be added to the call. Unlike Medicaid, in which people can be approved for Medicaid without an interview, SNAP recipients must receive a letter and then schedule an interview. Councilman Dale Miller called attention to the fact that the calling to determine SNAP eligibility is just one part of the overall process. Unlike Medicaid, in which people can be approved for Medicaid without an interview, SNAP recipients must receive a letter and then schedule an interview. This can further complicate the eligibility process, as letters can go to a wrong or outdated address. Gowan said the county is aware of the issue. Gowan responded by saying that while there was improvement in wait times and the number of unanswered calls, the county is still not where it needs to be, so efforts to improve customer service and experience will continue. In addition to the county’s phone system, three contracts were discussed during the committee meeting. Tiffany Dobbins-Brazelton, the new Director of Cuyahoga County Office of Child Support, testified as did Richard Weiler, who also works in the department, about a contract with the county treasurer’s office and the Court of Common Pleas. The $107,270 contract runs from January 1 to December 31 and assists with salaries of individuals who work at locations that receive child support payments when individuals wish to pay in cash. Most child support payments that are processed by the county, are made via direct garnishment of wages. However, some individuals still elect to pay in cash. The contract was approved under second reading suspension. The second contract also dealt with child support. The contract, for $11,137,752, runs from January 1, until December 31. The county has contracts with the Court of Common Pleas, the Divisions of Domestic Relations and Juvenile Court, as well as the Cuyahoga County Prosecutor’s office, for service delivery relating to child support. The prosecutor’s office logged 39,000 hours of time on issues related to child support in 2018, with an average cost of $93 per hour, according to Dobbins-Brazelton. The prosecutor’s office logged 39,000 hours of time on issues related to child support in 2018, with an average cost of $93 per hour, according to Dobbins-Brazelton. Miller asked if the total support for child support payments was going up or down. Dobbins-Brazelton said that collections are increasing, but she was unaware of specific figures. She said she would get that information to the councilman. Jones asked questions related to the 2 percent of administrative fees that the county gets paid for the administrative costs of child support. He wanted to clarify if the 2 percent comes from the total amount that a person has to pay in child support or if it is in addition to a required payment. Dobbins-Brazelton said that it is in addition. However, the county ensures that children and families receive their money first, before the county gets their administrative payment. The 2 percent fee is something that can still be garnished, if it is not paid. The contract was passed to the full council under second reading suspension. Finally, the committee heard about contract worth $823,375 with the Cuyahoga County Board of Developmental Disabilities to reimburse costs for 10 eligibility specialists, who work on the Developmental Disabilities Medicaid Waiver Program. Through an agreement with the Board of Developmental Disabilities, the county contracts with the agency to fund half of the staffing costs, and the board picking up the other half. The contract runs from January 1 to December 31. There was very little discussion about the contract and it was approved to the full council for second reading suspension.